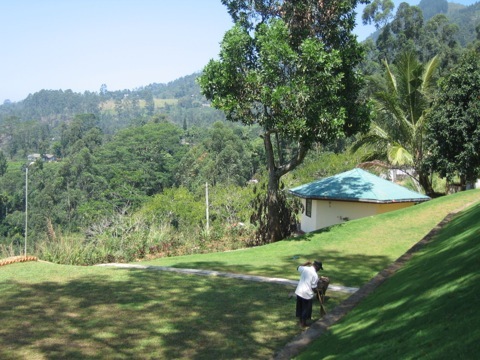 Ramboda lies west of Nuwara Eliya on the Kandy road and here Project Sri Lanka has supported the establishment of a sewing machine classroom in partnership with the Rotary Club of Colombo Mid-City. This sewing project aims to provide local ladies with machines so that they can develop their skills to the point where they can gain employment in the garment industry in Sri Lanka. Ladies were invited to apply for a place in the scheme, were interviewed and duly selected. In July 2013 Trustee Joy Palmer Cooper attended a ceremony when 10 sewing machines were presented to the ladies who had submitted successful applications. The company Singer agreed to provide training for these women and a classroom was establish on the hillside in the grounds of the Hindu Temple at Ramboda. It is hoped to expand this project in future years with the provision of more machines thus enabling other ladies to develop income generation potential.